The photos of Armin T. Wegner are among the few that capture the bleak struggle to survive facing Armenian deportees. As a second-lieutenant in the German army stationed in the Ottoman empire in April 1915, Wegner took the initiative to investigate reports of Armenian massacres. Disobeying orders intended to stifle news of the massacres, he collected information on the genocide and took hundreds of photographs of Armenian deportation camps, primarily in the Syrian desert. Wegner was eventually arrested, but not before he had succeeded in channeling a portion of his research material to Germany and the United States through clandestine mail routes. When he was transferred to Constantinople in November 1916, he secretly took with him photographic plates of images he and other German officers recorded. Fleeing from death. An Armenian mother on the heights of the Taurus. Her husband has been killed or massacred, thrown into prison or driven to forced labor. On her back she carries everything she owns, that is what she could take with her a blanket to sleep or to use as a tent for protection from the sun, some wooden sticks and then on top of everything, her baby. How much longer can she carry this weight? The government transported them by rail to the foot of the Taurus Mountains. In 1915, trains could not go any longer because the tunnel had not been built yet. From there, the refugees continued on foot. Pictures and testimonies , Guerini e Associati, 1996, P. 96. 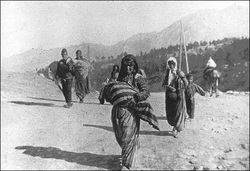 Armenian deportees - women, children and old men. The woman in the foreground carrying a child in her arms, protecting it from the sun with a shawl, the man on the left carries the bedding, no other belongings or food is there to be seen from what they wear. They all fall under the sun on a dirt road with no possibility of protection from natural elements. Location: Ottoman Empire, Syrian region. 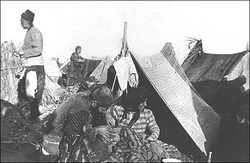 Armenian deportees living in the open desert in makeshift tents. The person in the middle with a long black robe and hat is an Armenian priest that probably performs funeral rites for the dead. Three men in the background are kneeling, others standing next to and behind the priest. The clothing of some deportees are already torn. Location: Ottoman Empire, Syrian region. 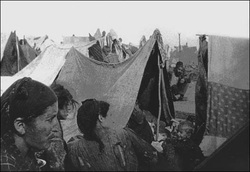 Armenian deportees in the camp of temporary tents inhabited mostly by women and children in the barren desert. "Abandoned and murdered young children of the (Armenian) deportees," according to the photographer, 1915-1916. Three are dead, including a stripped boy in the gutter. 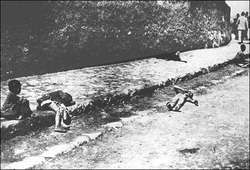 Murdered Armenian adult man lying in the ditch while the kids are looking at the corpse. 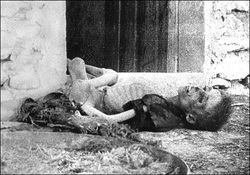 The corpse of an Armenian boy who has starved to death, collapsed at the threshold. 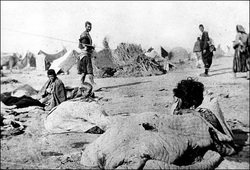 Armenian deportees living in the open desert with bedding as their only protection. Tent in the background. The person on the right is a woman with unwashed hair and an older boy sits on the left. 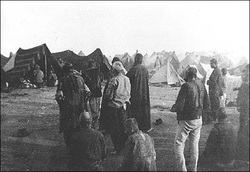 Deportation camps for Armenians living in tents in the desert. Every person in the photo is wearing rags. The elderly man in the foreground is picking lice from the head of a child, presumably his daughter, while another girl is watching. 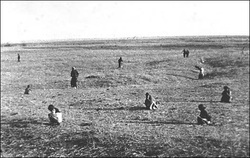 Orphaned Armenian children in the open, all the worn-out clothes, with a lot to protect his head against the desert sun. Twenty-eight boys in the foreground. Some adults seen in the background. 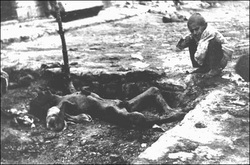 The corpse of a young Armenian grown man who has been murdered and stripped naked and lies along the way. Injuries to the head and lower chest are visible. Scattered deportees in the desert area, looking for grains as their only food source. There is no shelter, water or buildings in sight. 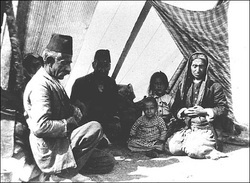 Deported Armenian family - two older couple and their two young children living in a tent in the desert. 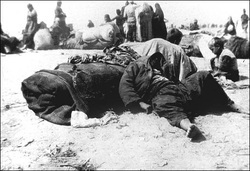 Armenian deportees along the deportation route in the desert rest on the ground. The deported families, all belongings are in a bundle on the ground. No tent is visible indicating that they have recently arrived to the site or shall immediately proceed further. Two boys are visible on the right. The man in the foreground is barefoot. 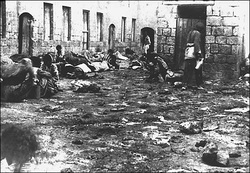 Armenian deportees sleeping in the street - mostly women who seem to be without families. Location Ottoman Empire, Syrian region. The skull, at various stages of decay, belonging to Armenian deportees, some of which may have been burned to death. "A 15-year-old child who died of famine" according to the photographer, 1915-1916. 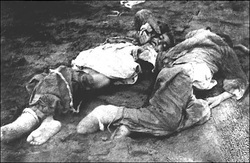 Two boys with bare and bandaged feet starved to death in the open desert. Location: Ottoman Empire, the Syrian desert. Armenian deportees who wash in the river Euphrates. Note that the river bed is full of people all the way to the edge of the photo. 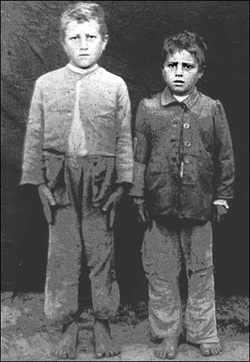 Two orphaned Armenian boys who are barefoot and have clothing that is worn out.